A great addition to the comfort section at any bookstore and the perfect gift for someone struggling with illness, pain, or discouragement in their life.Bestselling author Emilie Barnes reaches millions of people with her messages of living for God, getting the most out of marriage, and managing time to create loving homes. 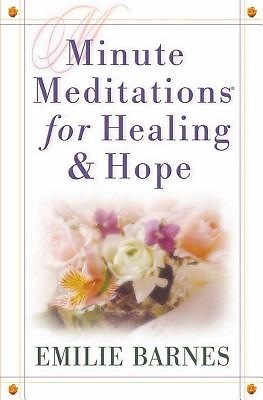 Following the format of her highly successful Minute Meditations for Women Emilie offers all-new devotions that encourage readers to seek God's ultimate strength for hope and healing. These devotions, written while Emilie was undergoing cancer treatment, reflect the deep emotional needs and dependence on God that adversity sparks in people who are experiencing turbulent times. Filled with guidance, encouragement, inspiring quotes, and practical advice, Minute Meditations for Healing & Hope shares the richness of living in Christ and helps readers spend time in God's Word and in prayer.